(iii) length = 15 cm, breadth = 2.5 dm, height = 8 cm. Find the height of a cuboid of volume 100 cm3, whose length and breadth are 5 cm and 4 cm respectively. A cuboidal vessel is 10 cm long and 5 cm wide. How high it must be made to hold 300 cm3 of a liquid? A milk container is 8 cm long and 50 cm wide. What should be its height so that it can hold 4 litres of milk? A cuboidal wooden block contains 36 cm3 wood. If it be 4 cm long and 3 cm wide, find its height. 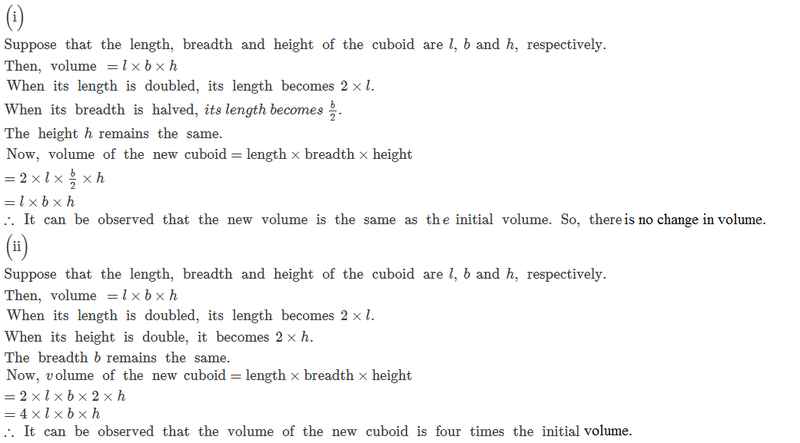 (i) Length is doubled, height is same and breadth is halved? (ii) Length is doubled, height is doubled and breadth is same? Three cuboids of dimensions 5 cm × 6 cm × 7cm, 4cm × 7cm × 8 cm and 2 cm × 3 cm × 13 cm are melted and a cube is made. Find the side of cube.